Event/inspiration: Exhibition at the National Museum of Australia called ‘Warakurna – All the stories got into our minds and eyes’, from the remote thriving art community of Warakurna in WA. Her stunning ‘pave’ technique is the outstanding feature of the design style Ngaire has chosen. Ngaire has used this technique to represent the contemporary style of the works in this exhibition, especially the outback landscape depicted in a work by artist Roshanna Yinga Williamson. Ngaire has chosen flowers and other materials to reflect the colours of outback Australia, and created a highly textured work to represent the intricately detailed painting styles of the Warakurna people, including dot painting and fibrous sculptures. 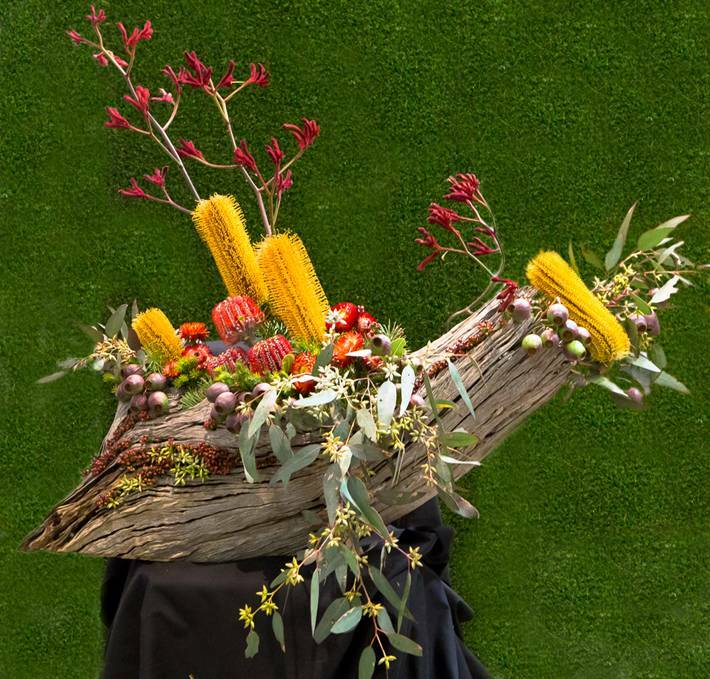 The canopy of the ‘pave’ includes Anigozanthos manglesii , the floral emblem of WA as a heightened placement in the arrangement, while the blackened banksias represent the spirits of the artists’ ancestors. 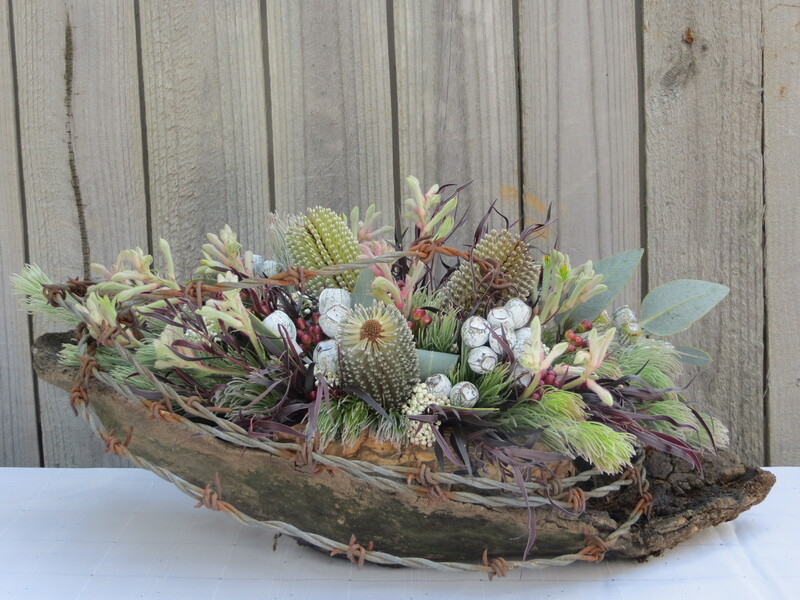 It is a design style that draws the viewer in to look into the detail, admiring the beauty of the plant materials and their clever use, exactly as Ngaire believes visitors to the exhibition need to appreciate the sculptures and paintings exhibited. 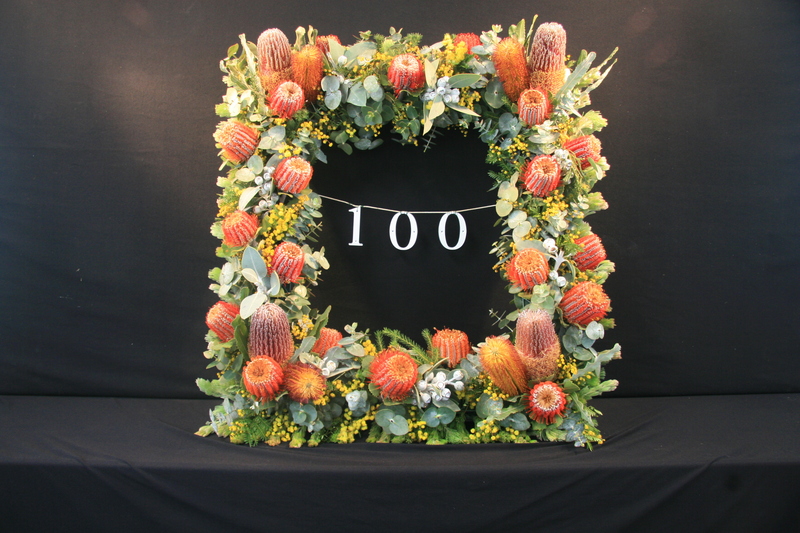 Regina created a floral frame to represent a view back to the past and also to the future of Australia, as Canberra is the place where the vision for our country is perceived by our leaders. Canberra also has places like the war memorial that reflect our past. The frame can also be used to surround a photo of the 100 Dreams Youth Dance Festival which has contributed to make Canberra a beautiful place in 2013. Event: J.M.W. Turner exhibition, National Gallery of Australia. Fionna focussed on the Turner painting ‘Disaster at Sea’ because its history is linked to the birth of Australia as a nation (the painting is of a wrecked convict ship which was bound for NSW). 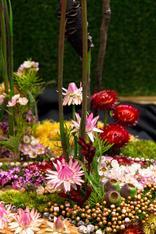 Her arrangement is designed to be placed in the foyer of the gallery. The flowers and foliages used in the design were chosen to reflect the warm colours in the painting – the red and orange of the burning boat and the reflection of these colours in the sky; contrasting with the silvery grey of the sea and the blue of the sky as depicted by the silvery grey of a weathered gum log (shaped like a sinking boat) which Fionna has chosen as the base for her beautifully constructed diagonal parallel arrangement. Fionna used flowing Eucalyptus branches to give the impression that the sinking boat is being overwhelmed by the sea. She has highlighted the interesting cracks and crevices in the log with red waxflower buds and gum nuts. Event/inspiration: Huts, Heritage and Homesteads Photographic Exhibition; Susan’s personal experience of living at ‘Strayleaf’ a small farm house located in a rural area of the ACT. 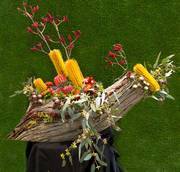 Susan’s first hand experience living in a small farmhouse in the ACT was the inspiration for her design. The landscape that surrounded ‘Strayleaf’ included textured grey green clumps of grass and scrubby bushes, the huge grey granite rocks dotted with lichen, a thick layer of dust that covered everything in a veil of sepia until it was washed clean with the rain, the rare drifts of snow in winter, the endless stretches of rusty barbed wire fences and the grey twisted and contorted trees. A piece of contorted Eucalypt wood forms the base and gives an immediate dynamic line. Paperbark covers the mechanics whilst the barbed wire creates negative space. The arrangement is a long and low design of interpretive form that was chosen to suggest the gentle undulation of the landscape, and radiates in all directions from the wood hollow. The size and shape of the design was determined by the base used. The colour scheme of the design is a near complementary combination of various tints and tones of blue-green and red-violet. As blue-green is the dominant colour of the design as it is of the Canberra rural landscape, contrast and interest was created through the different textures, sizes and shapes of the plant materials used. Sharlene based her arrangement on Walter Burley Griffin & Marion Mahony Griffin’s original winning design in the 1911 – 1912 Federal Capital Design Competition. Sharlene loved the overlapping circle concept applied to the way Canberra as a city is designed. The circles are apparent in the street layouts and also the manmade lakes when viewed from above. 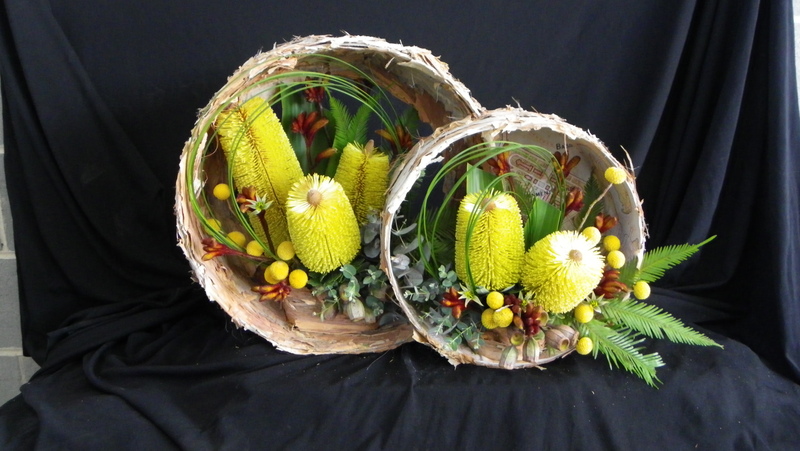 Sharlene’s design incorporates both natural and manmade elements using two circular cardboard hat boxes of different sizes. These are covered with either paperbark or a copy of the preliminary plan of Canberra - the paperbark represents the natural environment and the map represents the man made elements of the city. The circles overlap to represent the overlapping of the streets in ‘Design 29’. Flowers and foliages within the circles are placed at various levels and depths to depict the streets, parks and lakes of Canberra and are mainly in shades of yellow and green to symbolize the national colours of Australia.